How bullish and bearish forces align for stock indexes, forex and other global markets, both technical and fundamental outlooks, likely top market movers and lessons for the market week ahead. The following is a partial summary of the conclusions from the fxempire.com weekly analysts’ meeting in which we cover the global market outlook for the coming week, both lessons and potential market movers to watch. Support, resistance, and momentum indicators also move markets, especially in the absence of surprises from top tier news and economic reports. Key For S&P 500, DJ EUR 50, Nikkei 225 Weekly Charts: 10 Week EMA Dark Blue, 20 WEEK EMA Yellow, 50 WEEK EMA Red, 100 WEEK EMA Light Blue, 200 WEEK EMA Violet, DOUBLE BOLLINGER BANDS: Normal 2 Standard Deviations Green, 1 Standard Deviation Orange. The short version: Global risk appetite per our sample of leading US, European, and Asian indexes is mixed. The big down move of the week came Thursday following news of the Malaysian passenger jet shot down over Ukraine by Russian-backed separatists, reflecting fleeting fears that there might actually be sanctions coming that materially affect business as usual. This was followed by a rebound Friday, as these fears apparently faded for now. The US and Asian indexes continue their slow grind higher and remain in their double Bollinger® band buy zone, suggesting more upside ahead in the intermediate term. The same fundamentals that have supported the rally since mid-2012 (low rates, no perceived market threats), so the big fundamental picture supports the technical outlook. European indexes, in contrast, are showing weakening momentum signals that suggest a flat trading range in the weeks ahead. –They’re flat to lower in recent weeks, and all are trending lower over the past 4-6 weeks except for Germany’s DAX, which is down overall only over the past 2 weeks. What are the fundamentals behind these trends, and lessons we’ve gleaned for the coming weeks? 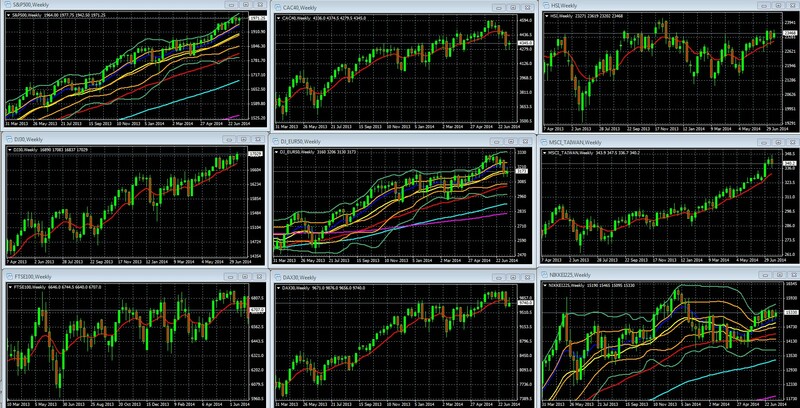 The S&P 500’s weekly and daily charts tell the story that applies worldwide. There was little net movement this week in most leading global asset markets. Thus although there was plenty of exciting news, and some lessons to note too, there were no meaningful new market drivers of lasting importance. So the big lesson for the coming week and beyond: There are plenty of headlines, but no new market drivers of significance. The same drivers of the current bull market continue to dominate. Low rates for the foreseeable future (see 2014’s Biggest New Investment Theme: Lower US Rates For A Much Longer Time for details). Janet Yellen’s congressional testimony last week reinforced this perception, as she said nothing new, continuing to express guarded optimism but note that there is still too much weakness to consider any material rate hikes. As we’ve noted in the past, we expect the Fed could well opt for a token hike of 25 bps in 2015, just to keep markets from getting too complacent. Indeed, it could stick with a 25 bps/year schedule and still have benchmark 10 year rates under 4% until around 2020. Portuguese bank troubles: Portuguese bank default threats, despite Europe’s lack of any real banking reform or functioning bank union, (see here, also here and here, for details) failed to have any lasting impact as markets continue to believe the EU will ultimately follow ECB President Draghi’s “do whatever it takes” approach. In other words, they’ll lend newly created money for as long as markets continue to accept it. Ukraine: Markets continue to believe no one will impose sanctions that materially affect business as usual. The shooting down of a Malaysian passenger jet by Russian backed rebels produced the one big down move for the week on Thursday, on fears that real sanctions might follow. Those fears dissipated by Friday and markets recovered, with most of our sample indexes closing the week slightly higher. Gaza: “No oil supply threats, no worries,” sums up market reaction to events there. In addition, Hamas’ unprovoked, intentional targeting of Israeli civilians, and its chilling willingness to expose its own citizens to danger as human shields (among other reasons) appears to have left it bereft of support from even most of its usual allies, reinforcing market indifference. China Versus All Its Neighbors: All quiet for now. Iraq, Syria, Lebanon: Ditto. Note however that Iraq is an oil producer, so any news hinting at potential cuts in production or exports are likely to produce some movement in oil markets at minimum. Any sign of shutdown could produce an oil price spike which in turn could hit prices for stocks, risk currencies, and other risk assets. Concerns about high valuations and slow growth data: These have been present since the start of the rally and are thus not seen as imminent threats as long as 1 & 2 above are in place. 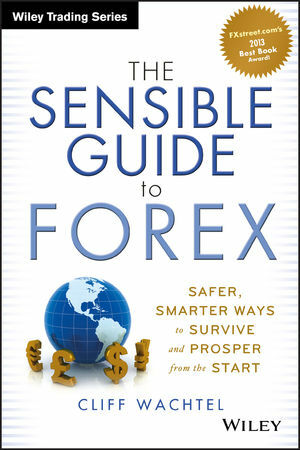 As noted in the above section on the technical picture, the big down move for stock markets worldwide came on Thursday, (following the news of the downing of the Malaysian jet liner), but that move was countered by a bounce Friday, as markets didn’t see any lasting economic impact from any likely additional sanctions. Thus the biggest market mover, the jet-downing, was ultimately a non-event for this week. As an overall market driver, earnings season has not been a factor. Only about 10% of firms have reported, and the tone has been mildly positive. However that does nothing to change market perceptions of a slow but steady US recovery. So here’s what you need to monitor. The first big market driver is the belief in low rates for a long time. Rate speculation will move with surprises in the metrics the Fed watches most, jobs and inflation. Janet Yellen noted in her comments to congress that she still sees significant slack in labor markets, and she recently noted that monthly inflation data is “noisy.” In sum, the Fed is focusing on long term trends and is not changing policy based on any given data point. That said, monthly data that really surprises could at least start some speculation and move markets in anticipation of a changing rate hike timetable. Existing home sales may be a factor too if it packs a material surprise to the upside. Recent housing data has been poor, so another weak or in line report won’t change market perceptions on US housing. CPI: A big upside surprise in inflation data could be the big news of the week because it could reignite rate hike speculation and drive risk asset and risk currency pairs like the EURUSD and AUDUSD lower. This is likely the biggest event risk of the week. That said, few expect anything more than a very gradual increase over many years, but a big inflation surprise could still ignite some short term speculative spike in rates. We doubt it would do more than that, as markets will remember that Janet Yellen believes inflation data to be “noisy” and thus not influential with the Fed in the short term. China: HSBC flash manufacturing (mfg) PMI. Focuses on smaller non-state owned firms, and seen as a bit more reliable than the government data. Important because like data from the US and EU, China data influences overall risk appetite more than that of most other economies, as a barometer of the health of a key global economy. EU: Flash manufacturing and service PMIs from France, Germany, and the EU overall, these will be the latest read of the EU economy. Spain unemployment and Italian retail sales may matter if they provide a substantial surprise up or down. EU PMIs are important but no one expects them to be good enough to change perceptions on ECB policy. In contrast, Fed rate expectations are bit more sensitive given that USD rate increases are only a question of when, not if. Thus US inflation data (CPI, also HPI) packs more market moving potential if it surprises in either direction. US: Flash mfg PMI. New home sales may matter if they provide a big upside surprise to counteract recent weak housing reports, Weekly new unemployment claims may be influential if they materially influence the 4 week moving average of weekly claims, as the Fed is correctly focusing on longer term trends rather than weekly data.